Join the revolution of Aerial Combat! Get in the cockpit of your favorite combat aircraft and engage in supersonic battles on an epic scale. Live the War zones in Photo-realistic Details! Prove your supremacy globally in multi-player online mode! Choose your tactical path in a massive scale, living battlefield! Command aerial, naval, and ground combat units! Pilot authentic licensed combat aircraft! Experience the intense drama of the battlefield! 02-12-2019 silverbow Description Packaging text in English and French. 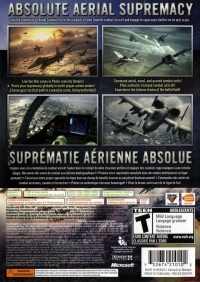 02-12-2019 silverbow Box Text ABSOLUTE AERIAL SUPREMACY Join the revolution of Aerial Combat! Get in the cockpit of your favorite combat aircraft and engage in supersonic battles on an epic scale. Live the War zones in Photo-realistic Details! Prove your supremacy globally in multi-player online mode! Choose your tactical path in a massive scale, living battlefield! Command aerial, naval, and ground combat units! Pilot authentic licensed combat aircraft! Experience the intense drama of the battlefield! 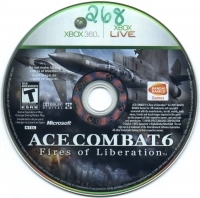 This is a list of VGCollect users who have Ace Combat 6: Fires of Liberation in their Collection. This is a list of VGCollect users who have Ace Combat 6: Fires of Liberation in their Sell List. 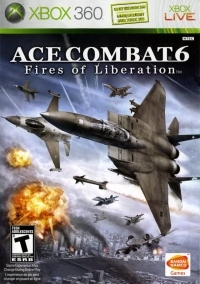 This is a list of VGCollect users who have Ace Combat 6: Fires of Liberation in their Wish List.